Summer days are winding down, and the Fall selling season is on its way! The Fall season has such an incredible energy. Not only is there the smell of pumpkin spice and leaves in the air, but there's also a sense of excitement. Like Fall itself, this season can be rejuvenating and can give life to our businesses no matter what phase of our business we are in. As a team leader, we all want our teams to feel this energy and let it flow through their business in the hopes it will grow into everything our team members dreamed it would be. The best way to have a successful Fall is to fill our calendars! A great place to start is to Fall is to begin with a Booking Blitz. For a consultant, taking that first step to success can be the hardest thing we have to do when we're looking to refuel our business. One of the obstacles we have to overcome is the fear of hearing the word 'No'. It can be incredibly disheartening and it may even make us shy away from wanting to share our opportunities with others. All of us struggle with this to some degree, even many of the most successful people in our business! We know it's hard, so it's our job as team leaders to help our team overcome the fear of 'No' to help them reach their goals. We all have high hopes for our team, and it's our job to encourage them to go for it! This business is what we make it, so let's make it the very best! Something is brewing on our team...Go for No Fall Booking Challenge! Are there people you would love to ask to host a party but are worried they might say no? 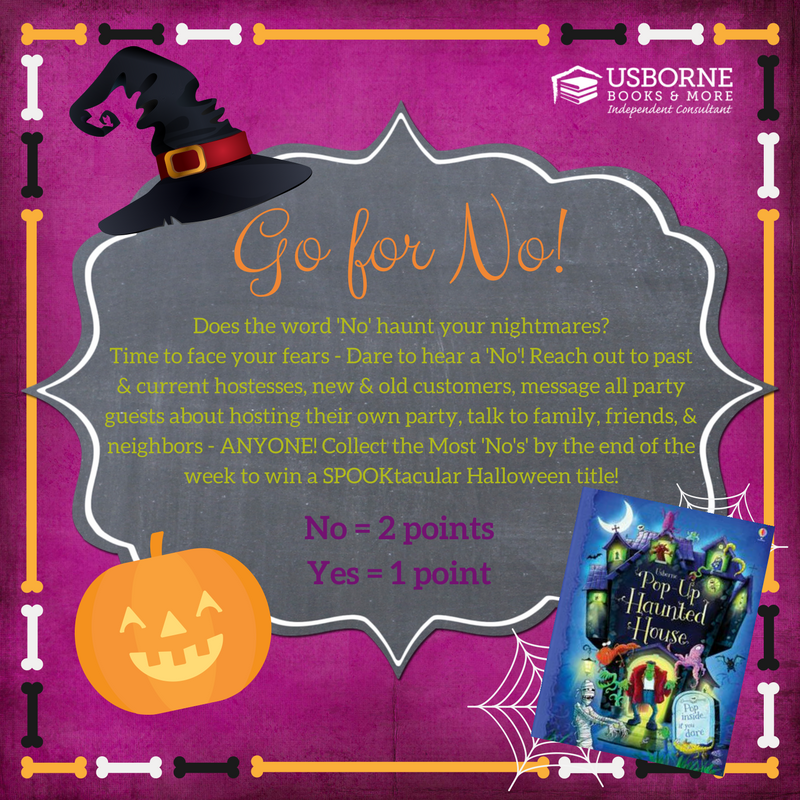 Our Go for No Booking Challenge is the perfect way to reward facing your fears and talking to those 'scary' friends about a Fall party! This is your chance to fill your calendars and talk to some new people about hosting a party for some Christmas gifts! Let them know the only TRICK is the TREAT of some FREE books! Don't let anyone miss out on the chance to get some FREE Christmas gifts this year! This challenge will run from *DATE* until *DATE*! Send me your points next Monday by noon MDT (Utah Time) for your chance to win a SPOOKtacular title! It might be a fright.